This page is browser friendly, by the way. Make your browser's window less wide than your whole screen and you will find the narrower columns much easier to read. a) At the top, there's a very basic program, introducing you to using the RFID reader with an Arduino. b) At the bottom is a second version of the program. It has been created by slightly modifying the first, to create something to open a door when either of two specific RFID devices are brought near the reader. Before we get down to work, how's this for a neat way to carry an RFID tag with you everyday? The central photo shows the tag. It is a small glass capsule. Sparkfun sell them in this form for about $5. My watch strap just happens to have a little cavity, just the perfect size, on its underside. I'm still looking for the "perfect" glue to hold it in place. Hot-melt glue wasn't the answer. Tags in the form of buttons ($4) (thin, 1.6cm across, no holes) or credit cards ($2) or keyring fobs are available too. In this page I will show you the basics of connecting an Innovations ID-20 RFID reader, available from Sparkfun.com, to an Arduino. ($35, (+p&p, 12/11.. unchanged at 2/19) While the essay was written while working with an ID-20, I don't believe that users of the ID-12 would do anything different. (The ID-12 is less expensive, $30, (+p&p, 12/11 & 2/19) but doesn't read over such a long range (120mm spec, vs 180mm)... In hindsight, I don't thing the extra range of the ID-20 makes any difference to me, in my application. I have the ID-20 behind a pane of glass, and "wipe" my RFID tag across the glass. I don't think the ID-12 would have trouble. But $5 to the extra power doesn't seem much either. If you take my advice, if you buy the Sparkfun product, you will also buy two of the 2mm socket strips that Sparkfun stock for you. Sadly, the useful breakout board Sparkfun used to offer was listed as "retired" 2/19. But it's no big deal. (It was Part SEN-08423, 95 cents, if you want to look at the spec. (Search on SEN-08423, then follow the obscure "retired products" link at the bottom of the results page. Let me know, if they bring it back into stock, please? Sorry- the pin numbers used below are the pins as numbered on that, but figuring out what you need to shouldn't be hard. The software presented here works fine with either reader, without tweaks. I've bought 125mHz tags from Sparkfun, from ITeadStudio, and from an eBay source... all work fine with either reader. ITeadStudio has some nice 28mm "key fob" tags, and they don't emblazon their logo across their product. Speaking of eBay... in addition to the tags I did receive... I saw some tags on eBay at a "too good to be true" price... and it was. Despite sending $3.98 by PayPal (Aug 11) to xiao2huan for something very like item 150632480332 (Dec 11), and a civil exchange of emails, no tags ever arrived, not the first shipment, not promised replacement. Have you ever tried to "work with" eBay when there's a problem? For a start, I can no longer call up the item description to see how the seller was listed. (Seller names and PayPal accounts are often different, sometimes for good reasons.) There is a price for everything. I often get good deals via eBay... but it is not unknown to be out of pocket. I look at it as just the price I pay for the good times. Enough about the reader! I should also mention the "Arduino" I've had the code in for at least 8 years of trouble free access to my home. I built this project with a Modern Device RBBB. $6, kit form (very easy assembly. Available assembled. (Usually $11)) 2/19 sale. Pin 11: Arduino's VCC, 5v. If you have a 3.3v Arduino, things are beyond my ken. Pin 9: Connect to Arduino's digital i/o pin "2". That's about it! 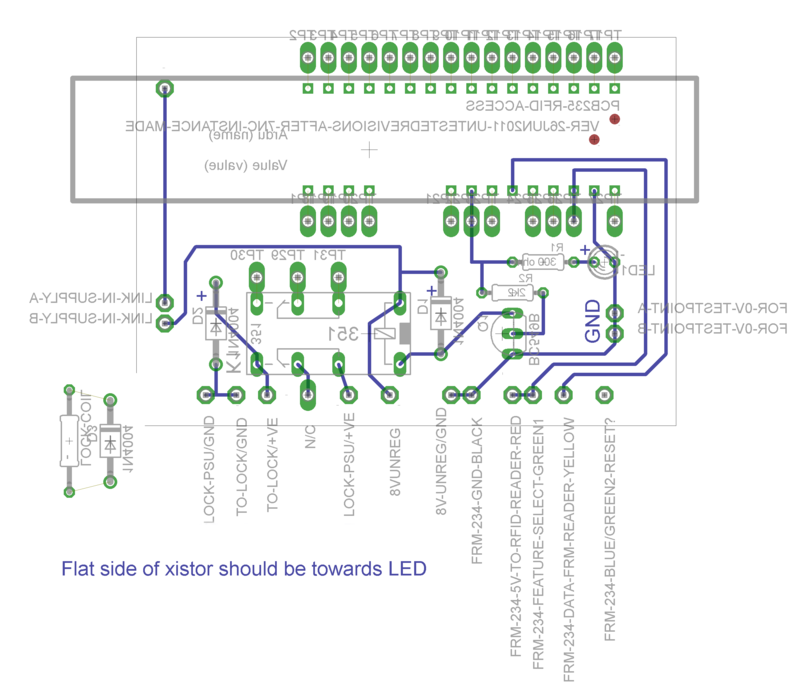 In the data sheet you will read that pin 10 is an output which, properly connected (at least a resistor... probably transistor plus resistor) can drive an LED, which will light when the reader "sees" an RFID device. Not necessary to what follows, but I mention it, just in case your needs are different. At this point, you can continue reading, and cover some background information which I think you might welcome, or you can "skip to the end", to go straight to the RFID-controlled door lock material. The arrangements for pins 1 and 7 are done that way to accommodate the particular proto-board I use, which has only a single connecting point outside the footprint of the Sparkfun breakout board. While with the simple software I am using at the moment, there is no need to be able to change the state of pin 2, and it should be kept at 5v, that pin is an input to the reader, and by having two long wires, one from pin 2, one from pin 11, to your source of 5v, you will be able to use the pin 2 input later, if you decide you want to use the feature it controls. Pin 9 from the RFID reader is where the reader outputs (TTL, inverted) what it reads from RFID devices... when the reader is configured for its ASCII mode, which it will be, if you've connected it as above. Leave the other pins connected to nothing. Don't worry about floating inputs. You will have to check the datasheet if you have an ID-2. They are similar devices... but there may be some minor but significant differences to accommodate. I don't believe that anything I've said here about working with the ID-20 doesn't apply equally to working with the slightly less expensive, slightly less sensitive ID-12. The strings always begin with a 2 and end with a 3. You can add code to check that these are seen, as a check that the unit wasn't outputting rubbish, or that you misread what it sent. It is possible to bring the RFID device back again too quickly after moving it away. If you think your reader is "missing" presented devices, be just a little deliberate in your "move it away"/ "move it back" process. The reader stops reading after it reads a device once until it detects no device present. It then "re-arms" itself. Having said all of that, it should be able to do, say, three reads in five seconds. The next 10 bytes will be the ASCII for the RFID device's unique code. As the RFID device with that code is one that I own, the lock wouldn't be much use to you... you would have to change the number to the number inside an RFID device you own! After the "stuff" already described: Always a 13 and a 10, the codes for "CR" (carriage return) and "LF" (line feed). And lastly: the number "3", as already mentioned. //critical "available()" function, does it? //  Creates serial port for RFID reader to be attached to. That's the heart of reading RFID tags with the Innovations modules from Sparkfun and others! Not too hard to follow, I hope? 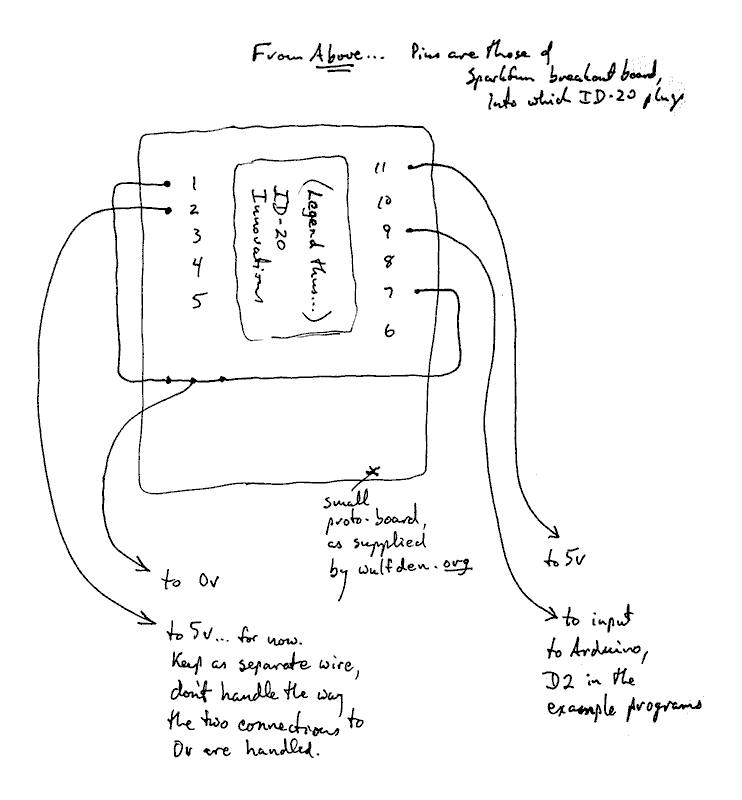 If you need help with the concepts associated with reading a stream of serial data from something outside the Arduino, my tutorial about how to send information to your Arduino from a PCmight be useful... but that might merely distract at this point. The above should Just Work. The simple demo above can be extended to make an access controller based on the Sparkfun ID-20, which interfaces easily to the Arduino easily. You'll need some way to unlock whatever you are controlling access to. An electromechanical strikeplate may well be part of the answer. On the software front, the program above is fine for determining the number supplied by a given RFID tag, and it is a start on a program that, for instance, opens a door when a particular tag is presented. First let's look at how we deal with the fact that your program and the reader operate "asynchronously". At the moment that the reader picks up the presence of a tag, and sends the number to your program, your program may be "away", doing other things. Happily, the Arduino employs buffers, and the NewSoftSerial library has an "available()" function. Also, every string from the reader begins with a "2", and ends with a "3". They allow you to confirm that you are reading one string of bytes from the reader, not the second half of one, and the first half of a subsequent string. If you provide your system with an LED to flash with a message, you can get it to report to you when it reads something that can't be right. In the simplest case, I would merely check the 12 bytes between the "2" and the "13 10 3", and if they matched what one of the authorizing RFID tags would present, I'd open the door. The fancier program would add a check to see if the program is seeing possible numbers. How, in the simple case, do we detect a misread? Forget the RFID reader, etc, for a moment. I'll give you a very simple example of a checksum. Suppose that you had to build something which would merely send a single digit from "A" to "B" every thirty seconds, but it won't always be the SAME digit. And further suppose that you are concerned that because of the way you are sending it, the data may become garbled... it might happen that a "5" sent from "A" might be received as, say, "7" at "B". A very simple checksum could be done as follows. At the receiving end, you compare the digit received and the checksum received, and if they don't add up to 10, you know that one or the other became corrupted in transmission. We have to take a little digression into number systems. Discard the "wrappings"... the "2" at the start, the "10 13 3" at the end. I now have my front door opening when I present an RFID tag to a reader in a window by my front door. The RFID tag "lives" in a crevice in the strap of my wristwatch. First the code. It is derives from the program above, with (really!) just a little added. There are comments in the code to help you follow what is going on. //critical "available()" function, does it? //    strikeplate (EMS) and optional LED. //Change pin used  if you wish. //DO NOT USE PIN 13 FOR THIS. //  Creates serial port for RFID reader to be attached to. //appending it to sFrmTag, above. LED is just to give you a visual indication of what should be happening. "RLY" is a small relay; D1 is The Important Diode you should always have on coils and DC motors (because they incorporate coils). There's more on why you need a "snubber diode" in a separate essay I wrote for you. As a result, every time the Arduino was reset, or there was one of the rare but not unheard of power cuts to my home, when the power came back, my front door unlocked. Don't use D13 to drive the electromechanical strikeplate that locks your door. If you don't want a "fascinating" excursion, you may skip down to information on PCBs for the Arduino/RFID Access Controller. Before I became aware of the fact that this brief high pulse on D13 is a "feature" of just D13, I set about "solving" the problem by putting a 1000 uF capacitor in the circuit where shown in blue above. The capacitor will normally be discharged. When the line from the Arduino goes high, the capacitor will start charging. It will take a little time (in human terms... a long time in electronic terms) for the voltage at the base of the transistor to rise high enough for the transistor to "turn on", i.e. allow enough current to flow to make the coil of the relay change over the contacts in the relay. This is a Bad Thing... because it will leave the transistor dissipating large amounts of power for too long. My circuit, with the capacitor, worked fine for many weeks. But during a time when I was converting everything from proto-board to PCB, and activating the lock repeatedly, with little "rest" between activations, I burned out the transistor. It was a bad design, and finally "fell over". 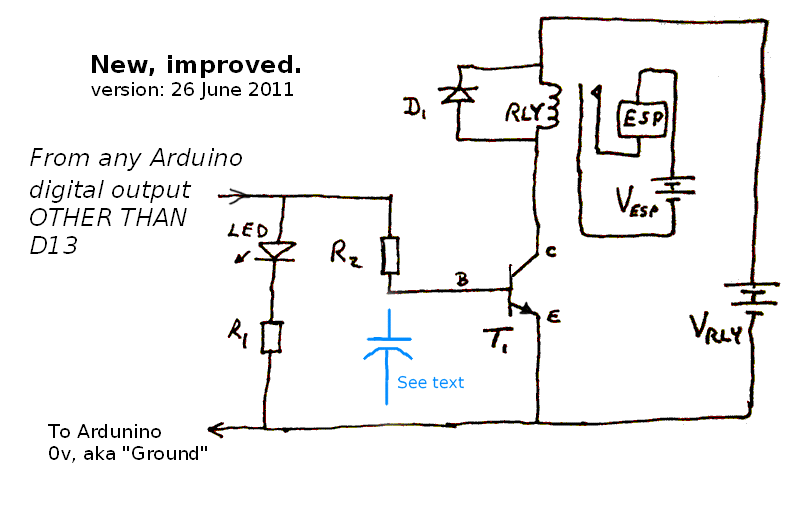 This is discussed in detail in the helpful discussion on the subject at the Arduino forum. Note how a specific question, with as many details as possible, even details the poster thinks irrelevant, can bring a rapid, helpful response. If you don't happen to use the RBBB for your Arduino work, fear not... the board would still save you a lot of time. I have a wall-wart producing an unregulated (and somewhat variable!) 8v. That goes first to my board (PCB235), to power the relay coil, etc, and from there is passed on to my RBBB. I have a link on PCB235 which allows me to disconnect the V-unreg feed to the RBBB when I am powering it via my USB programming cable. The following will show you how to connect my Arduino-carrying board to the 95 ¢ breakout board Sparkfun offers for the Innovations ID-20 (which they also sell, $35 (6/11)). The breakout board is well worth buying, and buy two of the 2mm pin sockets at the same time, and use them. You really don't need the following, but it tells you how to connect from my main board (above) to the RFID module. (The "Blue" connection is also called "Green2" in some places. It connects to the ID-20's "B2", which I didn't use in my design, but I thought I might want that signal someday. There is more discussion of these matters near the top of this page. 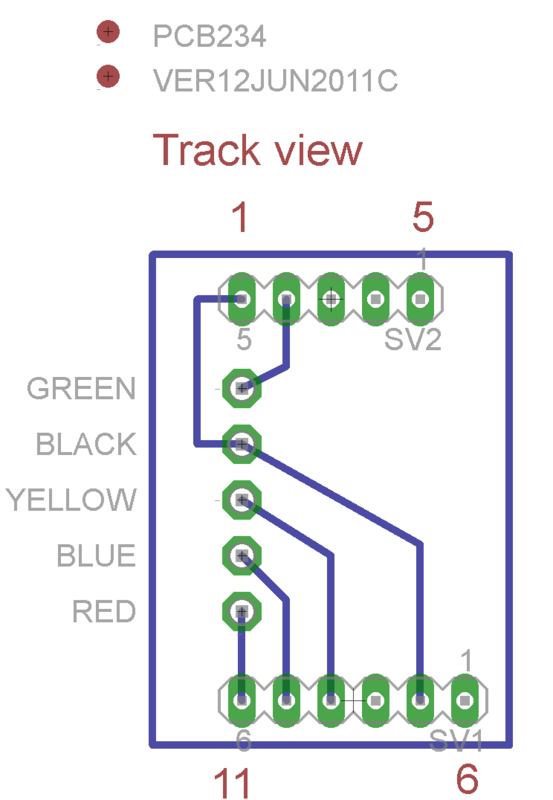 Nota bene: If you don't use my PCB as a "breakout for the breakout"!, be sure to inter-connect the two pins which need to be carried to the main board via the black wire. Please note that I have two other sites, and that the following search will not include them. They have their own search buttons.